It’s a dream come true for engineering-focused entrepreneurs. They get to concentrate on solving problems and the product spreads without them lifting a finger. But that only makes sense for so long. The next step to keep growing is to move upmarket and sell to enterprise customers. That’s where the real money is: enterprise contracts are huge, which means more revenue and higher valuations. Plus, SaaS is more stable at that level. As Jason Lemkin points out, enterprise customers churn at a much lower rate, so not only does the company get more users, but those users stick around longer, too—the growth compounds. Most entrepreneurs think that means ditching the beloved self-serve model. But, that’s a false dichotomy—they can have both. An internal sales team can apply the necessary white-glove care with bigger enterprise prospects while smaller clients continue to use self-serve. It’s called sales-supported SaaS, and it’s the best of both worlds. Once a company decides to move to the sales-supported self-serve model, they have to decide if they’re ready to take on those sales reps. Hiring salespeople is a high-stakes decision for SaaS entrepreneurs. Hire too soon and it could be a massive momentum killer for your self-serve business. But hire too late and you’ll miss out on the potentially massive revenue growth that comes from going upmarket into the enterprise. Is their customer lifetime value (CLTV) high enough to support a sales team? Are large (enterprise) trial accounts converting at a lower rate than smaller accounts? Is there complexity in the sales process for those enterprise accounts? In other words, is there enough of a problem for salespeople to solve? 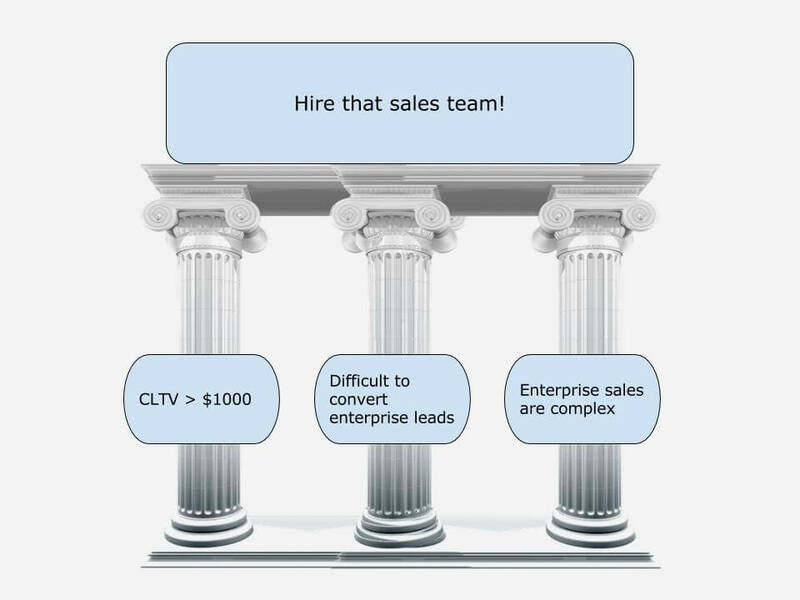 If the company fulfills each of those three pillars, then it’s ready to hire its first salespeople. A company that sells mostly to individuals and prosumers won’t have the customer lifetime value (CLTV) to grow efficiently with a sales team. Closing deals with individuals doesn’t bring in enough revenue to support a sales force. But a company already getting high CLTV users through the self-serve model? Now you’re talking. Here’s a rule of thumb—if the company’s average CLTV is below $1,000, an internal sales team doesn’t make sense. Those companies should either tweak their product and create a more enterprise-friendly (and more expensive) version, or make their current self-serve process as frictionless as possible. Look at it this way: if a company has surpassed $1,000 CLTV, anything is possible. By focusing more on the enterprise, why couldn’t that number grow to $5,000? Or $10,000? The market is clearly there—at $1,000 CLTV, at least some larger-sized customers are getting value from the product. A sales team makes it possible to deliver that value to even more of those bigger customers. After establishing that the company can indeed offer value to enterprise, the next step is to look at the sales process itself. It’s time to delve into the numbers behind how customers convert from free trial to paid plan. If bigger leads are converting at a lower rate than individuals, it indicates there are hurdles in the buying process that a salesperson can help overcome. It might sound intimidating, but it’s actually not that hard. The company just has to segment its leads and compare the rate at which bigger companies move through the pipeline versus smaller ones. Quantifying that information reveals a ton for startups, regardless of whether they’re considering adding salespeople. If those higher-value leads are converting at the same rate or even a higher rate than smaller ones, that indicates there’s nothing special about their buying process stopping you from signing them—there’s nothing a sales rep would be able to do. But if bigger leads are converting less, than a sales rep could be the answer. The last question the company needs to answer is whether there is complexity in the buying process that a sales team can unravel for bigger customers. There’s a huge misconception in the startup community that salespeople are some kind of magical elixir. Just hire them, turn them loose on the market, and watch your revenue grow. It’s much more complex than that. Salespeople add value by helping customers get around certain snags in the buying process—if no such snags exist for enterprise customers, there’s no opportunity for sales reps to bring in business. Longer buying cycle. It can take months, or even years, for a big company to purchase SaaS, but transactions on a web site take a few minutes. Salespeople are great at managing those longer processes. More decision makers. 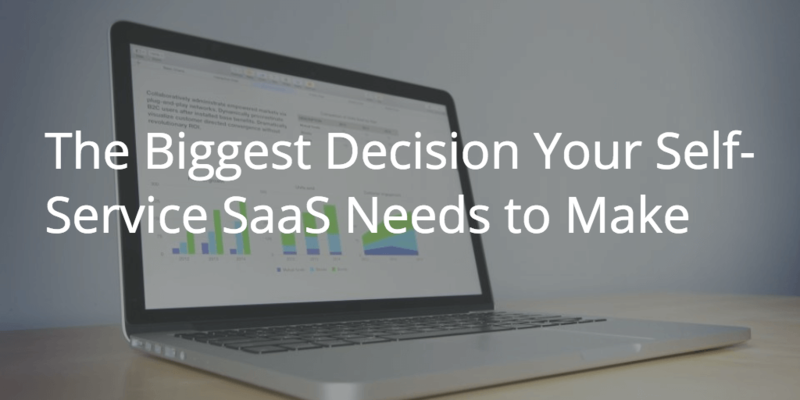 The self-serve model can’t account for the complexity of enterprise deals—there’s never just one person with the authority to say “yes” to a SaaS product. Salespeople know how to suss out how each stakeholder influences the buying process. Competitors. If you have competitors also being considered by enterprise prospects (not a given for a young SaaS company), a dedicated sales rep can either put you on par with them or give you a huge competitive advantage. Those are just some of the issues that separate the SMB sales cycle from the enterprise cycle. And, it’s up to the founder or some other higher-up to call the bigger prospects and figure out if those issues are there. If your startup has these three pillars pillars in place, it has the potential to enter a huge growth phase. Building an internal sales team to support your self-serve model will help you close those bigger customers—20x your current CLTV—that are already coming in via self-serve. And that internal sales team is just the first step. Get your foot in the door, gain momentum in the enterprise market, and you’ll soon move toward a full sales team and unlimited growth potential. This is a guest post by Steli Efti of Close.io, a complete inside sales solution for SMBs. You can follow up with him on Twitter and LinkedIn.